Director: Gutman I., Konovalov V.
Script writers: Gutman I., Konovalov V.
Operators: Baykov V., Golubev U., Dobronickiy V., Izvekov V., Maev V., Myakishev G., Petrosov R., Usanov V., Filatov I. 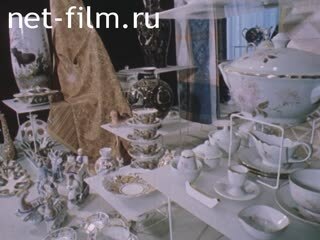 The film tells about the Soviet capital citizens, about Muscovites' achievements in the area of industry, science, culture, housing, about the Moscow city Communist Party organization. Moscow New Year's Eve - LS., MS., CU. Decorated Christmas tree on the square - CU., PNRM., MS. Working at the console machine with program control - MS.
A girl at work - CU. Scientists at the lab looking into a microscope - CU., PNRM. Man wearing headphones, working in a helmet - CU. Weaver for the machines - MS. The man at the blackboard with a pointer - CU., PNRM. On the production line - lamps for TV - MS.
Saleswoman Christmas toys - MS.
Surgeons do surgery - MS., PNRM. The meeting of the district report and election party conference, a conference room - LS. Delegates on the sidelines, the delegates are in the hall - MS., LS. Acts CPSU CC Politburo member and first secretary of the CPSU MGK Viktor Grishkin (synchronous) - CU. The hand presses the button - MS. Laureate of the State Prize of the USSR team leader Ivan Tyurin at work - LS., MS., PNRM. IM Tyurin, surrounded by young workers - MS., CU. International award "Golden Mercury» - MS., PNRM. Workers applaud - LS., MS. PNRM. 2nd Moscow Watch Factory: assembly hours - MS., PNRM. Women at work - CU., MS.
Weaving Mill: Girl at a loom - LS., CU., PNRM. Plant: Tube plant - LS., CU., PNRM. Assembly shop - MS., PNRM. Robots - LS., CU., PNRM. Building plant "Hammer and Sickle» - LS. The construction site at the plant - LS., PNRM. Reconstruction of the plant - LS., PNRM. Shop factory - LS., PNRM. A worker at a remote machine with program management - LS., PNRM. Secretary of the Party Committee of the plant Kurchatov Gribkov with young workers - MS., PNRM. Workers talk - CU., PNRM. Said the master of the Moscow Machine Tool Plant named after Ordzhonikidze Victor S. Emelyanov (synchronous) - CU. Photo: General Secretary of the Communist Party YV Andropov to plant them. Assembling a truck on the assembly line - MS., LS., PNRM. Party committee meeting - LS., MS., PNRM. Party committee meeting - LS., MS., PNRM., CU. Said factory worker (synchronous) - MS.
Robotic shop, design office - LS., PNRM. Men have the light installation - MS., CU. Students in the laboratory - MS., PNRM. Student looking through a microscope - CU., PNRM. Hand typing on a typewriter - CU. The device - CU., PNRM. The inscription "Institute of Chemical Physics» - CU. Laboratory Institute - LS., MS., PNRM. Director of the Institute, Lenin and Nobel Prizes, Academician Nikolai Semyonov in the laboratory - CU., PNRM. Laboratory technician near the device - CU. Samples of products developed by the institute - CU., PNRM. Apparatus "artificial heart» - CU. Surgeon during the operation - CU., PNRM. The device works - CU. Operation goes - MS., LS., PNRM. A doctor examining a woman in the hospital - CU., PNRM. Maternity Hospital - LS., MS.
Newborns in boxing - LS. Swaddling a newborn baby - CU., PNRM. Bathe a newborn baby - LS. Building children's clinic - LS., MS., PNRM. A doctor at the reception - CU. Child in the pool-Union Center for Maternal and Child learn to swim - MS., PNRM. A child in the water - MS., PNRM., CU. Children jumping into the water - LS. Children in hospital - LS., PNRM. Diagnostic equipment - CU., PNRM. A doctor examines a boy - CU., PNRM. District of Moscow Strogino - MS., LS., PNRM. At the construction site team members builder Vladimir's Zatvornitskogo - MS., LS., PNRM. VA says Zatvornitsky (synchronous) - CU. New homes in Strogino - MS.
House-building workshop - LS., PNRM., MS., CU. House panel on the assembly line - MS., CU., PNRM. BAM Street Presnya Tynda - LS., PNRM. Builder Anatoly Gusev and his team-mates at work - MS., CU. Gas pipeline - MS., PNRM. People near the bus - MS., PNRM. Kolkhoz Nechernozemie: elevator - LS., PNRM., MS.
Strewed grain - CU., PNRM. Village shop on the farm - LS., PNRM. Moscow: buildings, trolley - LS., PNRM. Passengers enter the trolley - LS., PNRM. The cabin - trolleybus driver, Officer of the Order of the Red Banner Ekaterina Larionov - CU. Reward Certificate - CU., PNRM. Says E. Larionov (synchronously) - CU. EN Larionov at the wheel - MS., PNRM. Hands on the wheel - CU. The people on the streets of Moscow - MS., PNRM. Station Chertanovskaya - MS. (With motion). Plaque with the names of the stations - CU., PNRM. The engineer in the cab - CU. The people in the Metro - LS., PNRM. Metro Station "Nakhimovsky Prospect", "Tula". Kazan station building - LS., MS. The people on the platforms - MS., PNRM. Is a freight train with cars - MS., LS., PNRM. Fadeevich machinist Victor Sokolov in the cockpit trains - CU., PNRM. Member of the Bureau of the Moscow City Party Committee Juice. Laid rails - CU., PNRM. Rise of the IL - 86 - MS.
Go to the airplane crew - MS., PNRM. The control panel in the cockpit - CU. Said the captain of IL - 86 Nicholas S. Samsonov (synchronous) - MS.
Backlit display in the terminal building - CU. Manager at work - MS. Landing aircraft - MS., CU., PNRM. Passengers leave the plane - MS. Tourists visiting the Kremlin - CU., MS., PNRM. Tourists visiting the Kremlin - MS.
Triumphal Arch - MS., PNRM. Moscow: anti-urchins on the streets - MS.
Tomb of the Unknown Soldier in Red Square - MS., CU., PNRM. Lay flowers at the Tomb of the Unknown Soldier - MS.
Eternal flame burns - CU. Gorky Street - MS., LS. Monument AS Pushkin - CU., PNRM. Cars on the streets - CU., PNRM. Kalinin Avenue - LS., PNRM. Cafe "Valdai» - LS., PNRM. Vacationers in the Park - LS. Girl reading a book - MS. Girl picking flowers - MS.
Anglers in the Moscow River - LS. Vacationers go boating on the river - MS.
Children's Carousel in the Park - CU. Tourists near the hotel "Cosmos» - CU., PNRM. Fountain in the USSR National Economy - MS. Rocket at the pavilion "Space" at ENEA USSR - CU. The facade of the Bolshoi Theater of the USSR (through jet fountain) - CU. People's Artist of the USSR, Lenin Prize winner, Hero of Socialist Labor ballerina GS Ulanova in rehearsals with schoolgirls - MS., CU., PNRM. Exhibition hall artists - CU., LS., PNRM. Paintings in the exhibition, among them - a portrait YA Gagarin - CU., PNRM. 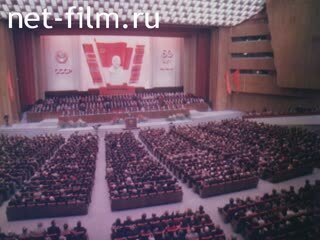 The building is a small theater of the USSR - MS., PNRM. Posters in the lobby of the theater - CU. In the dressing room - the secretary of the party bureau of the Maly Theater Artist Viktor Korshunov - CU., PNRM. Says V. Korshunov (synchronous) - MS. Scene from (synchronous) - LS. Bolshoi Theatre (evening) - LS. Fragment ballet (synchronous) - Various. Krylatskoye - LS., MS., PNRM. Swimming pool - CU., PNRM. Ride on track cyclists - MS., PNRM. Ran athletes - LS., PNRM. The game of hockey - LS., MS., PNRM. Photo CSKA goalkeeper, party secretary hockey team CSKA Vladislav Tretiak - MS., PNRM. Said Vladislav Tretsk - CU. Skate skiers - CU., LS., PNRM. Go athletes - CU., PNRM. Seamstress sew jackets - CU., PNRM. Shoe shop - LS. ; Manufacture shoes - MS. Shoes on the shelf - MS., PNRM. Sewing women's boots - MS. Admission shoe shop - MS.
Shoe shop window in the store - LS., PNRM. Mannequins in the studio - MS., PNRM. Customers consider things - MS. In the hall hang men's suits - PNRM. Jeans Sale - CU., PNRM. The building department "Moscow» - MS.
House china - MS., PNRM. On display - porcelain - MS., PNRM. The House furniture - MS., PNRM. It should be the furniture in the store - MS., PNRM. Passers-by outside the store - PNRM. Department store "May Day» - LS., PNRM. The carpets in the stands at the store - CU., PNRM. Go past the shop passers - MS.
Department of cotton goods store - MS.
Baby clothes on the counter - CU. The building department "Moscow» - LS. (From left). The interior of the store - LS., PNRM. Grocery store: a man buys a product - MS., PNRM. Vegetable department store: vegetables on the counter - LS., CU., PNRM. A woman buys greens - MS., PNRM. Showcase grocery store - MS., PNRM. Hothouse farm "Southern" in the Stavropol region - LS. Cucumbers in a greenhouse - CU. Women at work - CU. On the wall chart table orders receiving orders - CU. (From left). Workers receive orders - CU., PNRM. A woman makes a request - MS., LS. Building of "service stations» Kuntsevo - LS. (With collisions). Workers washed parts - MS., PNRM. Mechanics repairing car - LS., PNRM. Spinning wheels of the car over a viewing hole - CU., PNRM. Checking the speedometer - CU. Brush Works car - CU. Car wash workers - MS.
New bridge in Krylatskoye - MS., LS. Apartment buildings - CU. (From left). Hall and the new cinema auditorium - LS. New apartment - MS., PNRM. Behind the desk boy does lessons - MS.
Said employee confectionery plant "Rot Front", whose family has a new apartment (synchronous) - CU. In the courtyard of the new children are walking home - CU., MS., LS. Children swim in the pool - MS., PNRM. Dancing children - CU., MS.
School Plant - LS., PNRM. Workers packed greenhouse cucumbers - CU. Passing car with vegetables - LS., PNRM. Customers choose apples, lemons in grocery store - CU., MS., PNRM. Bread baker kneading dough - CU. The machine picks up sticks of dough - CU. Worker dough forms - MS.
Take out of the oven bread loaves - MS., PNRM. Bread products - CU., PNRM. Girl puts bread in containers - CU. Yuri Kuzmich Azarskov baker in a bakery - CU. Bakers make a loaf - CU. Hands do the circle of dough - CU. JK Azarskov lubricating oil finished loaf - MS. Factory orders - MS. (With collisions). Products on display - CU., PNRM. Teacher and student at the blackboard - CU. First-grade students at their desks - CU., PNRM. First-grader at the board - CU., PNRM. Manifestation of Muscovites in support of the policy of the Party for Peace and Disarmament - LS., MS. (With collisions). Anti-war slogan - CU., PNRM., MS.
Rally participants say (synchronous) - CU., MS. (With collisions). The people on the streets of Moscow - LS., MS.
Anti-war rally - LS., MS., PNRM. People vote - MS., PNRM. Party veterans at the monument to VI, Lenin in the Kremlin - MS., CU., PNRM. Cabinet VI Lenin - CU., PNRM. Party veterans office VI Lenin in the Kremlin - MS., PNRM. Books in the office of VI Lenin - CU., PNRM. Photo: General Secretary of the CPSU Central Committee, Chairman of the Presidium of the Supreme Soviet of the USSR Yu Andropov with party veterans - LS., MS.
KDS Hall: grand meeting to mark the 60th anniversary of the USSR - LS., PNRM. On the podium of the General Secretary of the CPSU Central Committee Yuri Andropov, says (synchronously) - MS., LS., PNRM. Listening to - MS., PNRM. Newspaper reports of the work of the Plenum of the Central Committee of the CPSU - CU., PNRM. Plenum delegates on the sidelines of DTP - MS., PNRM. Speakers working Victor Logunov, teacher Zoya Kiseleva, Brigadier drifters Metrostroi Alexander Sukhanov (synchronously) - CU. Delegates vote - LS., PNRM. The evening Kremlin - LS., PNRM. Kremlin towers (evening) - MS.
Red Square (evening) - LS. Building of Children's World (evening) - LS., PNRM. Pushkin monument to Pushkin Square - LS.